The video:”Panta Rhei” shows A stream of lights slowly emerging from the black. The lights move like a meander through the image. They fill the image and eventually disappear again. The moving lights are reminiscent of fireflies but also evoke associations with a star sky. 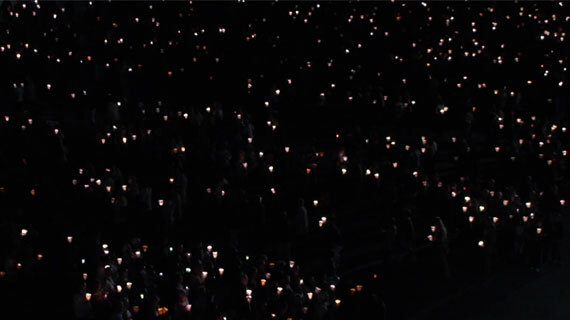 The recording shows a light procession, of slow-moving people moving through the image as the video progresses. The title of the work: "Panta Rhei" means "Everything flows" This refers to the thought of Heraclitus that everything in this world is constantly changing: "One can not step twice in the same river, because it is fresh water that you are constantly flowing towards."